By Gary Gamble June 2, 2016 Hollywood / Indie Cinema / movies / NEWS / RANTS / upcoming releases to watch out for . I think you’ll agree with me that things have been a little worrying since Cary Fukunaga left Stephen King’s, It remake due to creative differences with the studio (never a good sign). We all know that Mama director Andy Muschietti has replaced Cary Fukunaga as director for New Lines 2-part remake. Up until now its been uncertain about who will play the iconic role of Pennywise. Will Poulter (We’re The Millers) was Fukunaga’s first choice to play Pennywise. I thought that was a fine choice – although I would never have pictured him in that role – I was still intrigued to see what he could bring to the part. News later broke that Poulter had to drop out of the project due to scheduling conflicts. Articles started to surface around the web saying that the number one choice to play Pennywise was kirk Acevedo (Band Of Brothers) and everyone thought that the deal was done, but it looks like the studio has chosen someone else. Variety have reported that the new Pennywise has been cast and his name is…………. 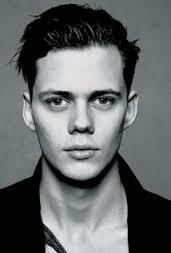 Bill Skarsgård (Divergent, Hemlock Grove). DO YOU WANT A BALLOON ? Hollywood / Indie Cinema / movies / NEWS / RANTS / upcoming releases to watch out for .